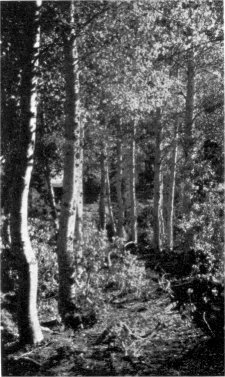 As one of the most interesting trees of the higher elevations in the park, the aspen is rendered conspicuous by the character of its bark, which is generally smooth and white, and the habit of the leaves quivering in the slightest breeze. Park visitors who remain on the Valley floor will not have the pleasure of observing the graceful beauty of this tree for it is found in the Canadian and Hudsonian Zones, rarely growing below 5,000 feet. It will be most readily noted along the Tiogo Road in the vicinity of Yosemite Creek, on the Glacier Point Road near Bridalveil Creek or in the vicinity of Badger Pass, along the trail between Nevada Falls and Merced Lake, about Washburn Lake, and between Glen Aulin and Waterwheel Falls. Aspen Valley owes its name to the groves of this species in that area. Although generally smooth and white (sometimes with a cream-colored or light green cast), the bark is often marked with numerous black, wart-like protuberances. On older trees it is generally rough and dark brown at the base. The slender limbs are irregularly bent and stand out straight from the trunk. Where aspens are found in the open the limbs form a loose, narrow, dome-like crown that extends throughout most of the tree’s height. However, the aspen is very intolerant of shade and under crowded conditions it produces a very long, slender trunk with a small rounded crown occupying but the upper third of the tree’s height. It prefers moist, sandy, mineral soils and thus is most commonly found along streams and canyon bottoms where it often forms attractive groves. Under such conditions it rarely fails to gain the admiration of the passerby for what it lacks in size it overcomes in grace and beauty. The aspen is not a large tree, the maximum height being about 50 to 60 feet and the diameter 12 to 30 inches. It is also short-lived, rarely being more than 50 to 60 years old. Trees 10 to 14 inches in diameter average about 30 to 40 years of age. The leaves, almost round in outline and ending in a definite point at the apex, are one and one-half to three inches in diameter, and edged with small, regular serrations or teeth. They are shiny and smooth, deep yellow-green above and lighter on the underside. The most distinctive character of the leaves, however, is their habit of fluttering in the slightest breeze. 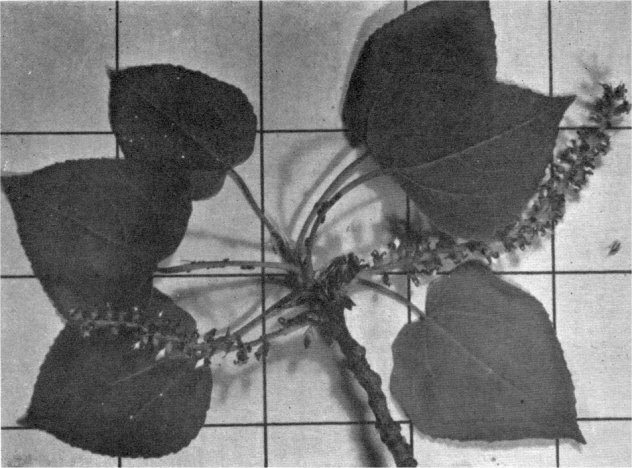 The reason for this is readily accounted for by the long leaf stem or petiole (one and one-half to three inches in length) which is flattened from the sides. The specific name, tremuloides, was applied because of the quivering habit of the leaves. It also accounts for the common name of quaking aspen. Interesting at any time of the year because of its many outstanding characteristics, it is at its best in the fall. At that time the sombre, green clad mountainsides of the upper elevations are enlivened by brilliant patches of bright golden yellow and orange as the foliage of the aspen assumes its characteristic brilliant shades preparatory to dropping from the tree in anticipation of the winter season. Fall arrives early at altitudes frequented by the aspen, being at its height in September with the first signs of autumn occasionally being evident as early as late August. As in the case of all members of the willow family the staminate (male) and pistillate (female) flowers of the aspen are borne on separate trees, occurring as pendent, tassel-like clusters (cements). Staminate clusters are one and one-half to two and one-half inches long; pistillate clusters are four inches long at maturity, bearing numerous elongated capsules containing many tiny seeds attached to conspicuous cottony filaments which aid in the dissemination of the seeds by the wind. It is one of the most widely distributed North American trees, occurring from the northern-most extent of tree growth from Labrador westward to Alaska, and southward at progressively higher elevations into the southern Sierra Nevada and Rocky Mountain regions.